It is always rewarding to take visitors around the town and show them the many interesting sights. 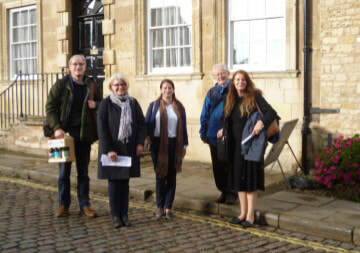 This year the Society has had more requests for tours than we have been able to handle, as many groups want to visit the town due to Stamford being the first place to be designated a Conservation Area. Groups that we have been able to host include a visit from a large number of Peterborough Civic Society members. Cambridge Blue Badge Guides had an initial introductory talk about the town’s history before setting out on a self-guided tour. The Institute of Historic Building Conservation East Midlands Group held their AGM here and was given a tour afterwards. Bidwells, the property company, and SKDC organised a one-day conference to mark the 50th ​anniversary of the Civic Amenities Act, with prestigious speakers representing different professions whose life and work have been ifluenced by this legislation. The Society was just one of a number of organisations to supply guides so that delegates could have a tour of the town. pairs of hands to help.